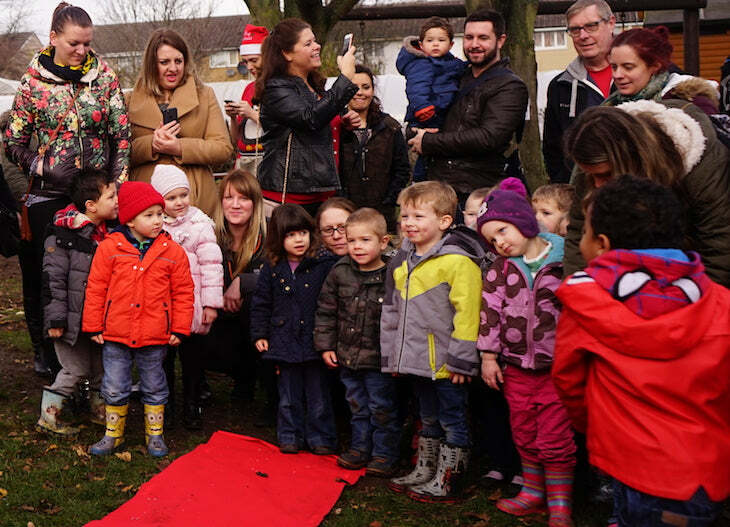 Local MP, Chris Leslie was there to open Santa’s grotto. 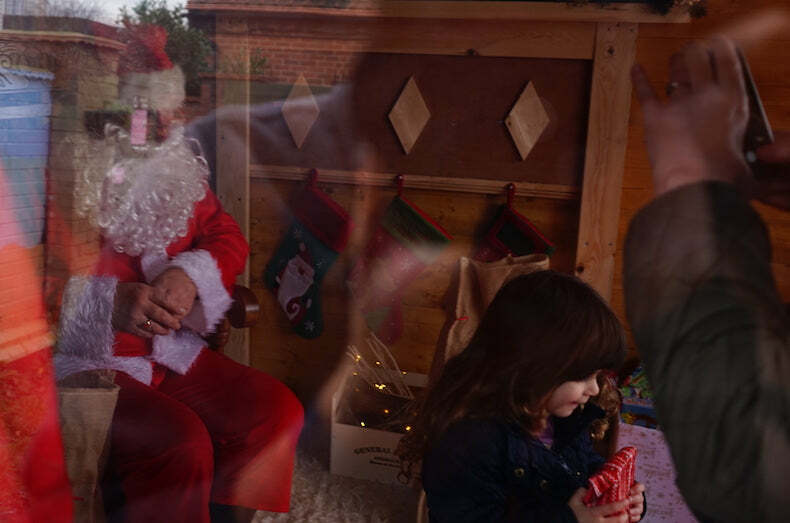 To celebrate the festive time of year, Waltons has donated a bespoke Santa’s grotto to our good friends at Stonebridge City Farm in Nottingham. Our Sussex summerhouse has been transformed into a one-of-a-kind grotto, decked with snow, real Christmas trees and festive sparkle. Santa will be sat in his rocking chair beside the handmade fireplace, handing out gifts to visitors over the Christmas period to spread the seasonal joy. If you fancy creating your very own Santa’s grotto, check out our guide on how to transform your garden shed into a place of festivity. Local MP and patron of the charity, Chris Leslie, cut the ribbon alongside Santa to reveal the grotto at 11.00am on Friday 9th December. 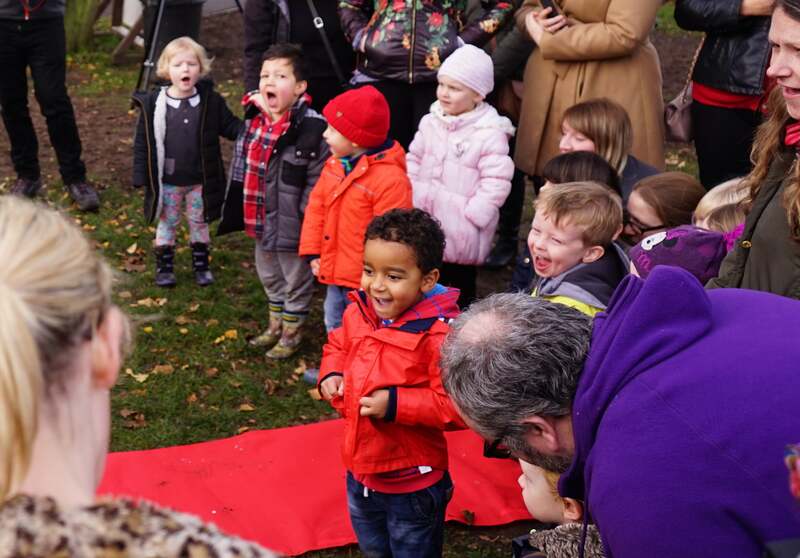 Excited schoolchildren from Seely Primary and Nursery School posted wish lists and awaited eagerly to visit Santa inside the grotto to receive their present. Santa’s sleighs parked beside the red carpet, led the way into the snowy grotto. Santa’s rocking chair took pride of place next to the handmade fireplace and a real twinkling Christmas tree. “Everybody loves the whole Christmas period, but it’s nice to give the kids a reason to come and get excited. Your support helps to bring fun to the neighbourhood”. If you would like to visit Santa, the grotto will be open between 10.00am and 3pm everyday at the farm until Tuesday 20th December. The address for the farm is: Stonebridge City Farm, Stonebridge Road, Nottingham, NG3 2FR. There is a small 50p entry fee to visit Santa or a £2.00 donation to visit Santa and receive a present. All the money raised will go towards the charity. Why donate to Stonebridge City Farm? The exitement builds as the children are waiting! Waltons have worked with the local charity since 2013 and have previously donated a log cabin, used as an animal handling centre, and the one-off Space Shed which was featured on Channel 4’s programme, Shed of the Year. The farm was victim to vandalism earlier this year and to help lift spirits in the community, Waltons have donated the grotto as a Christmas gift. Based in Nottingham city centre, the farm offers a much needed green space and offers a place for adults and children with physical and learning difficulties to learn, play and relax. After the Christmas season, the summerhouse will be moved to a new location, hooked up to electricity and used as an activities centre for storytelling and exhibitions. “It’s support from local companies like Waltons that help us put back into the community. We love the grotto and we are sure it will be very popular on the farm over the festive period”. We’d love to hear how you are celebrating the festive season. Have you been to see a grotto this year? Let us know on our Facebook page.